CycleOps 200 Pro Indoor Cycle steps it up a notch with the Joule™ 3.0, a cycling computer designed specifically for indoor cycling training. Precise resistance control lets you adjust the difficulty level of your ride, and the freewheeling hub lets you take breaks and coast when needed. The stable platform allows for sudden sprinting workouts or inspired hill climbs. Built on CycleOps' standard Pro Series frame, it features freewheel gearing and is fully adjustable so that you can create the perfect fit for your body and riding style. After a good ride, Joule™ 3.0 lets you access a dashboard, reports and full history of your cycling. 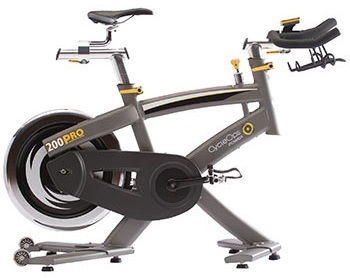 Buy CycleOps Pro 200 Indoor Cycle - FREE SHIPPING!